There is a whole cow in my garage. I’m not even joking, friends. We recently bought a whole pasture-raised cow for the freezer. Today I’m sharing my first-time experience buying an entire pasture-raised cow. Of course, it’s in pieces and packages but all 527 lbs (hanging weight) of it are in there. 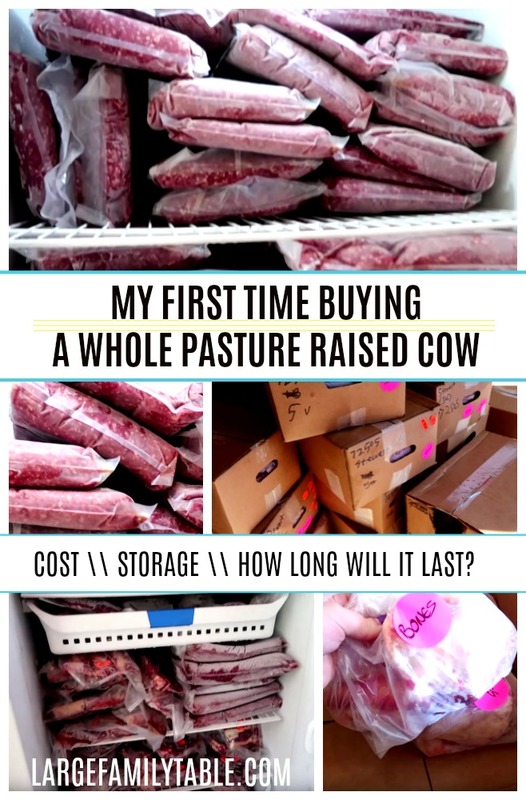 Today, I will share all the details with you about the whole cow buying process including the total cost of a cow, how I’m storing the cow, and how long I think this freezer full of cow meat will last our family of ten. It just so happens that our homeschool group was touring a farm last spring and this is a pasture-raised farm, so they pasture raise all of their animals that they sell for meat. This means the cows are 100% grass-fed and grass finished. Now let me say up front that we are not a family who eats organic everything or pasture-raised everything. I am just a real mom trying to do the best I can to feed my growing large family while staying within our budget. And while we were at this farm, I looked at their meat prices. And I started doing some figuring. I wanted to figure out the amount I spend on meat for our family in a month and in a year. After I did all my figuring, I came to the conclusion that I could save money or spend pretty close to the same amount by purchasing this whole cow over buying the same type of meat at a grocery store or even Costco. I can’t say yet whether this meat will last our family an entire year because this is an experiment. You can be sure that I will let you know how it is lasting as I use it up throughout the year. Have the cash ready. Yes, I had to have all the money necessary to purchase all the meat at once. That’s very different than buying your meat a few lbs. at a time. However, I never buy just a “few lbs” of much of anything. I spent several hundred dollars a month on meat from the grocery store or bulk food store. Set aside freezer space. 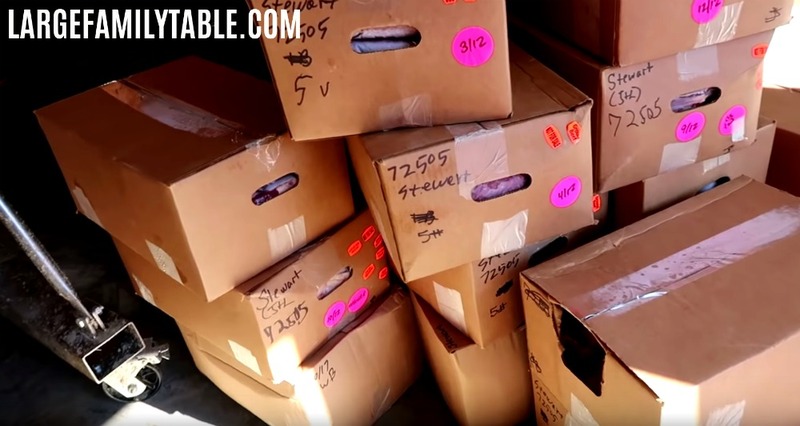 I think it goes without saying that you are going to need a lot of freezer space for 527 lbs. of beef. Did I mention that I also bought 25 pasture-raised chickens? We’ll get to that in a minute. 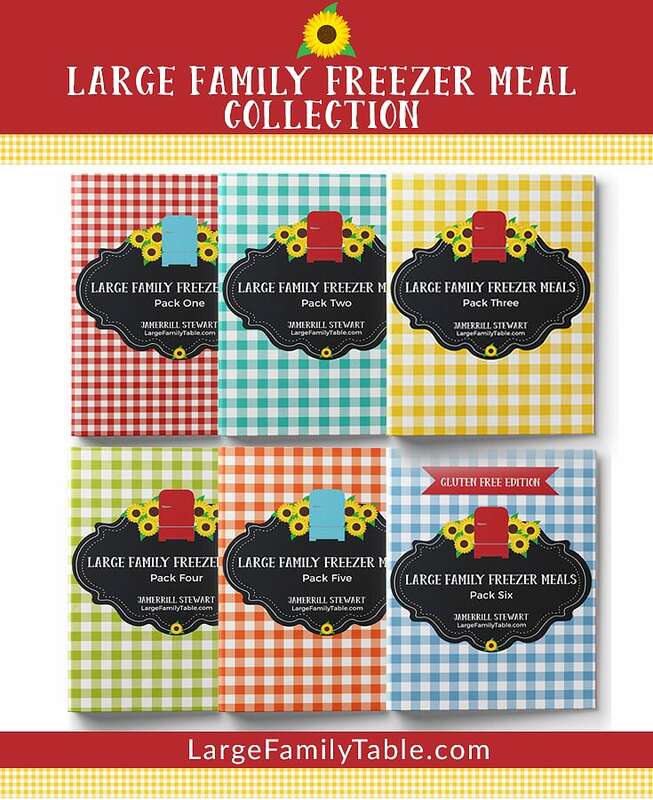 I invested in a 2nd large family freezer (here is my favorite large family freezer) figuring I always need freezer space so this 2nd freezer would go to good use! This was yet another added expense but I considered it a long-term investment. When I ordered my cow, (haha, that just sounds so funny) I had to put down a deposit of around $200. I received a form to fill out that specified what cuts I preferred from the cow. There were several choices based on the different cuts of meat. I chose to get all the steaks, roasts, and ground beef possible. I did not get the tongue, the brain, or any of the organ meats, although I did get the kidneys and the bones. I wanted those bones to make some super high-quality beef bone broth. I had all the meat delivered to our home for an extra $25 which I think was worth every penny. They literally brought every box to my door and it was all perfectly labeled. 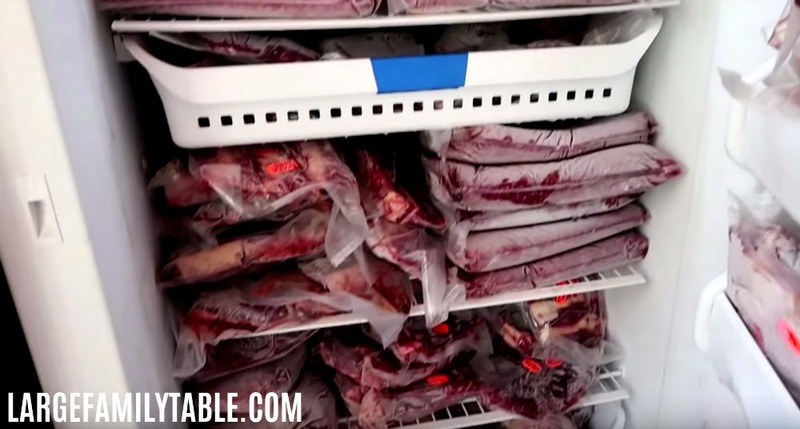 I do have a video of me unboxing all of the meat and I show you how I have my freezer set up to handle all of it if you’re interested in that. 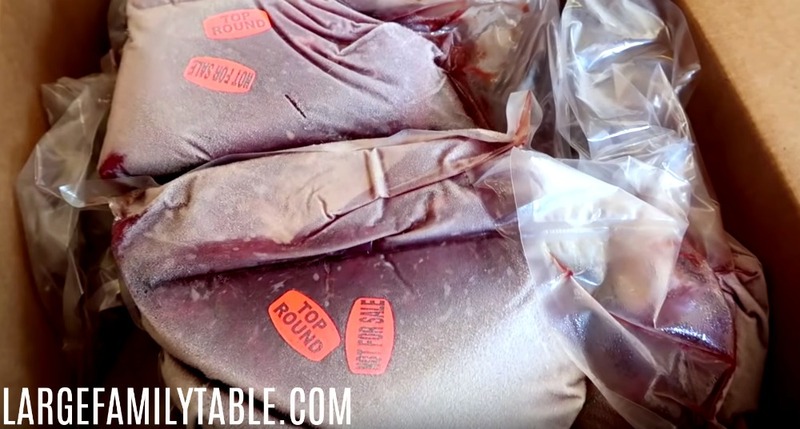 One of the things I did not know going into this bulk beef buying process was that the meat would be vacuum-sealed. I am so happy about that and how fresh the meat will stay with absolutely no chance of freezer burn. I know for sure that it will be fine for at least a year if it lasts us that long. 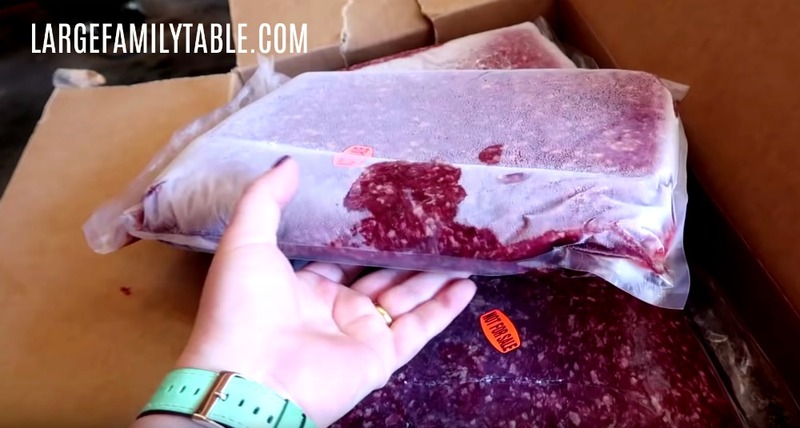 The ground beef is separated into 5 lb packages and the roasts are all packaged separately. When Travis grilled some of the New York Strip steaks last weekend, we found out that they are packaged two to a pack. Isn’t that perfect? Not that we usually have leftovers but I love knowing that we can be precise in how much we cook because that saves money. The cow I bought had a hanging weight of 650 lbs and I received 527 lbs of meat. I paid just over $2,900 for the meat and bones. Of course, there are things that factor into the cost besides just the meat itself but I ended up paying right around $5.50 per lb for each pound of pasture-raised beef that I received. I think that is an amazing price for the quality of meat we are talking about. I surely can’t walk into any grocery store and buy a pasture-raised roast or steaks for $5.50 per pound. Remember, this is $5.50/lb for pasture-raised grass-fed ground beef, and also $5.50/lb for Ribeyes, Sirloins, Beef Roasts and more. Last time I bought steaks at the store they were at LEAST $12/lb and they were NOT pasture-raised. Lean 90/10 ground beef is at least $5/lb and again it’s not grass-fed. It really is a great savings! Of course, we are only a few weeks into using the meat from this whole cow so I can’t speak to every situation yet. One thing I think I would do differently would be to request a printout of each type of cut and how many pounds of each cut I receive. That would allow me to do a much better cost breakdown for myself and for you if you are thinking about purchasing a whole cow for your family. Getting the meat and sorting it all out into sections in my brand-new meat freezer was, of course, very exciting. But now that excitement is over and we have moved into actually cooking with this meat. I mentioned above that I also purchased 25 of their pasture-raised chickens for a great bundle price and I did that for the express purpose of making homemade chicken bone broth. I do that by cooking the hen in my electric pressure cooker and then pulling all of the meat off the bones for chicken salad and to top green salads. Then I took the bones and made bone broth in the pressure cooker. I have also used some of the beef bones to make homemade beef bone broth. Now let me say this if you are not ready to purchase an entire cow but you would like to make some high-quality bone broth, just start by buying one pasture-raised chicken and make bone broth from it. And if you already purchase a whole or half cow every year, be sure to ask for those bones so that you can use them for bone broth. This is also a yet-to-be-seen guesstimate. I was recently talking with a friend who farms. She has 3 small children and said that a whole cow lasts her family of five about 12-18 months. I have a family twice that size with adults, teens, almost teens, lots of elementary-aged kiddos, and some littles. My best estimate at this time is an entire cow will last us about 9 months. I joke about that in my new cow buying video because most good things take about 9 months around here, ha! As with everything, friends, you do what you can for your family. If all you can do is buy the 70/30 roll of ground beef at the grocery store, then you buy it and you pray over it and you are doing a great job. There are times I have had more flexibility and times when I have had less. Do what you can with what you have and be thankful for it all. I hope this has been helpful for those of you curious about the process of buying a whole cow. I have heard from some ladies that they go in with a friend to buy a whole or half cow and divide up the meat while splitting the cost. Maybe that would be an option for those of you who aren’t ready to spend the money on a whole cow or who don’t have room in their freezer for 527 lbs of meat. Be sure to watch my new I BOUGHT A COW video on Youtube!